Abdullah I bin Al-Hussein (Arabic: عبد الله الأول بن الحسين‎, Abd Allāh Al-Awal ibn Al-Husayn, February 1882 – 20 July 1951) was the ruler of Jordan and its predecessor state, Transjordan, from 1921 until his assassination in 1951. He was Emir of Transjordan from 21 April 1921 to 25 May 1946 under a British mandate, and was king of an independent nation from 25 May 1946 until his assassination. According to Abdullah, he was a 38th-generation direct descendant of Muhammad as he belongs to the Hashemite family. Born in Mecca, Hejaz, Ottoman Empire, Abdullah was the second of three sons of Hussein bin Ali, Sharif of Mecca and his first wife Abdiyya bint Abdullah. He was educated in Istanbul and Hejaz. From 1909 to 1914, Abdullah sat in the Ottoman legislature, as deputy for Mecca, but allied with Britain during World War I. Between 1916 and 1918, he played a key role as architect and planner of the Great Arab Revolt against Ottoman rule that was led by his father Sharif Hussein. Abdullah personally lead guerrilla raids on garrisons. Abdullah became emir to the Emirate of Transjordan in April 1921, which he established by his own initiative, and became king to its successor state, Jordan, after it gained its independence in 1948. Abdullah ruled until 1951 when he was assassinated in Jerusalem while attending Friday prayers at the entrance of the Al-Aqsa mosque by a Palestinian who feared that the King was going to make peace with Israel. He was succeeded by his eldest son Talal. In their Revolt and their Awakening, Arabs never incited sedition or acted out of greed, but called for justice, liberty and national sovereignty. In 1910, Abdullah persuaded his father to stand, successfully, for Grand Sharif of Mecca, a post for which Hussein acquired British support. In the following year, he became deputy for Mecca in the parliament established by the Young Turks, acting as an intermediary between his father and the Ottoman government. In 1914, Abdullah paid a clandestine visit to Cairo to meet Lord Kitchener to seek British support for his father's ambitions in Arabia. Abdullah maintained contact with the British throughout the First World War and in 1915 encouraged his father to enter into correspondence with Sir Henry McMahon, British high commissioner in Egypt, about Arab independence from Turkish rule. (see McMahon-Hussein Correspondence). This correspondence in turn led to the Arab Revolt against the Ottomans. During the Arab Revolt of 1916–18, Abdullah commanded the Arab Eastern Army. Abdullah began his role in the Revolt by attacking the Ottoman garrison at Ta'if on 10 June 1916. The garrison consisted of 3,000 men with ten 75-mm Krupp guns. Abdullah led a force of 5,000 tribesmen but they did not have the weapons or discipline for a full attack. Instead, he laid siege to town. In July, he received reinforcements from Egypt in the form of howitzer batteries manned by Egyptian personnel. He then joined the siege of Medina commanding a force of 4,000 men based to the east and north-east of the town. In early 1917, Abdullah ambushed an Ottoman convoy in the desert, and captured £20,000 worth of gold coins that were intended to bribe the Bedouin into loyalty to the Sultan. In August 1917, Abdullah worked closely with the French Captain Muhammand Ould Ali Raho in sabotaging the Hejaz Railway. Abdullah's relations with the British Captain T. E. Lawrence were not good, and as a result, Lawrence spent most of his time in the Hejaz serving with Abdullah's brother, Faisal, who commanded the Arab Northern Army. When French forces captured Damascus at the Battle of Maysalun and expelled his brother Faisal, Abdullah moved his forces from Hejaz into Transjordan with a view to liberating Damascus, where his brother had been proclaimed King in 1918. Having heard of Abdullah's plans, Winston Churchill invited Abdullah to a famous "tea party" where he convinced Abdullah to stay put and not attack Britain's allies, the French. Churchill told Abdullah that French forces were superior to his and that the British did not want any trouble with the French. On 8 March 1920, Abdullah was proclaimed King of Iraq by the Iraqi Congress but he refused the position. After his refusal, his brother who had just been defeated in Syria, accepted the position. Abdullah headed to north to Transjordan and established an emirate there after being welcomed into the country by its inhabitants. Although Abdullah established a legislative council in 1928, its role remained advisory, leaving him to rule as an autocrat. Prime Ministers under Abdullah formed 18 governments during the 23 years of the Emirate. Abdullah set about the task of building Transjordan with the help of a reserve force headed by Lieutenant-Colonel Frederick Peake, who was seconded from the Palestine police in 1921. The force, renamed the Arab Legion in 1923, was led by John Bagot Glubb between 1930 and 1956. During World War II, Abdullah was a faithful British ally, maintaining strict order within Transjordan, and helping to suppress a pro-Axis uprising in Iraq. The Arab Legion assisted in the occupation of Iraq and Syria. Abdullah negotiated with Britain to gain independence. 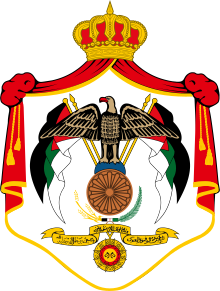 On 25 May 1946, the Hashemite Kingdom of Transjordan (renamed the Hashemite Kingdom of Jordan on 26 April 1949) was proclaimed independent and Abdullah crowned king in Amman. 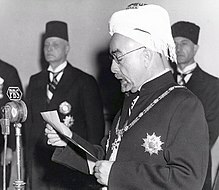 King Abdullah declaring the end of the British Mandate and the independence of the Hashemite Kingdom of Jordan, 25 May 1946. Abdullah, alone among the Arab leaders of his generation, was considered a moderate by the West. It is possible that he might have been willing to sign a separate peace agreement with Israel, but for the Arab League's militant opposition. Because of his dream for a Greater Syria within the borders of what was then Transjordan, Syria, Lebanon, and the British Mandate for Palestine under a Hashemite dynasty with "a throne in Damascus," many Arab countries distrusted Abdullah and saw him as both "a threat to the independence of their countries and they also suspected him of being in cahoots with the enemy" and in return, Abdullah distrusted the leaders of other Arab countries. Abdullah supported the Peel Commission in 1937, which proposed that Palestine be split up into a small Jewish state (20 percent of the British Mandate for Palestine) and the remaining land be annexed into Transjordan. The Arabs within Palestine and the surrounding Arab countries objected to the Peel Commission while the Jews accepted it reluctantly. Ultimately, the Peel Commission was not adopted. In 1947, when the UN supported partition of Palestine into one Jewish and one Arab state, Abdullah was the only Arab leader supporting the decision. In 1946–48, Abdullah actually supported partition in order that the Arab allocated areas of the British Mandate for Palestine could be annexed into Transjordan. Abdullah went so far as to have secret meetings with the Jewish Agency (future Israeli Prime Minister Golda Meir was among the delegates to these meetings) that came to a mutually agreed upon partition plan independently of the United Nations in November 1947. On 17 November 1947, in a secret meeting with Meir, Abdullah stated that he wished to annex all of the Arab parts as a minimum, and would prefer to annex all of Palestine. This partition plan was supported by British Foreign Secretary Ernest Bevin who preferred to see Abdullah's territory increased at the expense of the Palestinians rather than risk the creation of a Palestinian state headed by the Mufti of Jerusalem Mohammad Amin al-Husayni. The claim has, however, been strongly disputed by Israeli historian Efraim Karsh. In an article in Middle East Quarterly, he alleged that "extensive quotations from the reports of all three Jewish participants [at the meetings] do not support Shlaim's account...the report of Ezra Danin and Eliahu Sasson on the Golda Meir meeting (the most important Israeli participant and the person who allegedly clinched the deal with Abdullah) is conspicuously missing from Shlaim's book, despite his awareness of its existence". According to Karsh, the meetings in question concerned "an agreement based on the imminent U.N. Partition Resolution, [in Meir's words] "to maintain law and order until the UN could establish a government in that area"; namely, a short-lived law enforcement operation to implement the UN Partition Resolution, not obstruct it". Historian Graham Jevon discusses the Shlaim and Karsh interpretations of the critical meeting and accepts that there may not have been a "firm agreement" as posited by Shlaim while claiming it is clear that the parties openly discussed the possibility of a Hashemite-Zionist accommodation and further says it is "indisputable" that the Zionists confirmed that they were willing to accept Abdullah's intention. On 4 May 1948, Abdullah, as a part of the effort to seize as much of Palestine as possible, sent in the Arab Legion to attack the Israeli settlements in the Etzion Bloc. Less than a week before the outbreak of the 1948 Arab–Israeli War, Abdullah met with Meir for one last time on 11 May 1948. Abdullah told Meir, "Why are you in such a hurry to proclaim your state? Why don't you wait a few years? I will take over the whole country and you will be represented in my parliament. I will treat you very well and there will be no war". Abdullah proposed to Meir the creation "of an autonomous Jewish canton within a Hashemite kingdom," but "Meir countered back that in November, they had agreed on a partition with Jewish statehood." Depressed by the unavoidable war that would come between Jordan and the Yishuv, one Jewish Agency representative wrote, "[Abdullah] will not remain faithful to the 29 November [UN Partition] borders, but [he] will not attempt to conquer all of our state [either]." Abdullah too found the coming war to be unfortunate, in part because he "preferred a Jewish state [as Transjordan's neighbour] to a Palestinian Arab state run by the mufti." King Abdullah welcomed by Palestinian Christians in East Jerusalem on 29 May 1948, the day after his forces took control over the city. The Palestinian Arabs, the neighbouring Arab states, and the promise of the expansion of territory and the goal to conquer Jerusalem finally pressured Abdullah into joining them in an "all-Arab military intervention" on 15 May 1948, which he used to restore his prestige in the Arab world, which had grown suspicious of his relatively good relationship with Western and Jewish leaders. Abdullah was especially anxious to take Jerusalem as compensation for the loss of the guardianship of Mecca, which had traditionally been held by the Hashemites until Ibn Saud seized the Hejaz in 1925. Abdullah's role in this war became substantial. He distrusted the leaders of the other Arab nations and thought they had weak military forces; the other Arabs distrusted Abdullah in return. He saw himself as the "supreme commander of the Arab forces" and "persuaded the Arab League to appoint him" to this position. His forces under their British commander Glubb Pasha did not approach the area set aside for the Jewish state, though they clashed with the Yishuv forces around Jerusalem, intended to be an international zone. According to Abdullah el-Tell it was the King's personal intervention that led to the Arab Legion entering the Old City against Glubb's wishes. After conquering the West Bank, including East Jerusalem, at the end of the war, King Abdullah tried to suppress any trace of a Palestinian Arab national identity. Abdullah annexed the conquered Palestinian territory and granted the Palestinian Arab residents in Jordan Jordanian citizenship. In 1949, Abdullah entered secret peace talks with Israel, including at least five with Moshe Dayan, the Military Governor of West Jerusalem and other senior Israelis. News of the negotiations provoked a strong reaction from other Arab States and Abdullah agreed to discontinue the meetings in return for Arab acceptance of the West Bank's annexation into Jordan. King Abdullah with Glubb Pasha, the day before his assassination, 19 July 1951. On 16 July 1951, Riad Bey Al Solh, a former Prime Minister of Lebanon, had been assassinated in Amman, where rumours were circulating that Lebanon and Jordan were discussing a joint separate peace with Israel. 96 hours later, on 20 July 1951, while visiting Al-Aqsa Mosque in Jerusalem, Abdullah was shot dead by a Palestinian from the Husseini clan, who had passed through apparently heavy security. Contemporary media reports attributed the assassination to a secret order based in Jerusalem known only as "the Jihad". Abdullah was in Jerusalem to give a eulogy at the funeral and for a prearranged meeting with Reuven Shiloah and Moshe Sasson. He was shot while attending Friday prayers at Al-Aqsa Mosque in the company of his grandson, Prince Hussein. The Palestinian gunman fired three fatal bullets into the King's head and chest. Abdullah's grandson, Prince Hussein, was at his side and was hit too. A medal that had been pinned to Hussein's chest at his grandfather's insistence deflected the bullet and saved his life. Once Hussein became king, the assassination of Abdullah was said to have influenced Hussein not to enter peace talks with Israel in the aftermath of the Six-Day War in order to avoid a similar fate. The assassin, who was shot dead by the king's bodyguards, was a 21-year-old tailor's apprentice named Mustafa Shukri Ashu. According to Alec Kirkbride, the British Resident in Amman, Ashu was a "former terrorist", recruited for the assassination by Zakariyya Ukah, a livestock dealer and butcher. Ashu was killed; the revolver used to kill the king was found on his body, as well as a talisman with "Kill, thou shalt be safe" written on it in Arabic. The son of a local coffee shop owner named Abdul Qadir Farhat identified the revolver as belonging to his father. On 11 August, the Prime Minister of Jordan announced that ten men would be tried in connection with the assassination. These suspects included Colonel Abdullah at-Tell, who has been Governor of Jerusalem, and several others including Musa Ahmad al-Ayubbi, a Jerusalem vegetable merchant who had fled to Egypt in the days following the assassination. General Abdul Qadir Pasha Al Jundi of the Arab Legion was to preside over the trial, which began on 18 August. Ayubbi and at-Tell, who had fled to Egypt, were tried and sentenced in absentia. Three of the suspects, including Musa Abdullah Husseini, were from the prominent Palestinian Husseini family, leading to speculation that the assassins were part of a mandate era opposition group. The Jordanian prosecutor asserted that Colonel el-Tell, who had been living in Cairo since January 1950, had given instructions that the killer, made to act alone, be slain at once thereafter, to shield the instigators of the crime. Jerusalem sources added that Col. el-Tell had been in close contact with the former Grand Mufti of Jerusalem, Amin al-Husayni, and his adherents in the Kingdom of Egypt and in the All-Palestine protectorate in Gaza. El-Tell and Husseini, and three co-conspirators from Jerusalem, were sentenced to death. On 6 September 1951, Musa Ali Husseini, 'Abid and Zakariyya Ukah, and Abd-el-Qadir Farhat were executed by hanging. Abdullah is buried at the Royal Court in Amman. He was succeeded by his son Talal; however, since Talal was mentally ill, Talal's son Prince Hussein became the effective ruler as King Hussein at the age of seventeen. In 1967, el-Tell received a full pardon from King Hussein. Princess Haya (1907–1990). Married Abdul-Karim Ja'afar Zeid Dhaoui. King Talal I (26 February 1909 – 7 July 1972). Princess Munira (1915–1987). Never married. Prince Nayef bin Abdullah (14 November 1914 – 12 October 1983; A Colonel of the Royal Jordanian Land Force. Regent for his older half-brother, Talal, from 20 July to 3 September 1951). Married in Cairo or Amman on 7 October 1940 Princess Mihrimah Selcuk Sultan (11 November 1922 – March 2000, Amman, and buried in Istanbul on 2 April 2000), daughter of Prince Şehzade Mehmed Ziyaeddin (1873–1938) and his fifth wife, Neshemend Hanım (1905–1934), and paternal granddaughter of Mehmed V through his first wife. Princess Maqbula (6 February 1921 – 1 January 2001); married Hussein ibn Nasser, Prime Minister of Jordan (terms 1963–64, 1967). Princess Naifeh (1950– ) married Sameer Hilal Ashour. ^ a b c d e f g Hoiberg, Dale H., ed. (2010). "Abdullah". Encyclopædia Britannica. I: A-ak Bayes (15th ed.). Chicago, Illinois: Encyclopædia Britannica Inc. p. 22. ISBN 978-1-59339-837-8. ^ "Abdullah I quotes". Arabrevolt.jo. 1 January 2016. Archived from the original on 22 July 2018. Retrieved 20 July 2018. ^ Shlaim, 2001, p. 82. ^ Tripp, 2001, p. 136. ^ Landis, 2001, pp. 179–184. ^ Rogan, Eugene; Shaim, Avi (2007). The War for Palestine. Cambridge University Press. pp. 109–110. ^ a b c d Karsh, Efraim The Arab-Israeli Conflict, London: Osprey, 2002 p. 51. ^ Avi., Shlaim, (1 January 1988). Collusion across the Jordan : King Abdullah, the Zionist movement, and the partition of Palestine. Columbia University Press. ISBN 9780231068383. OCLC 876002691. ^ "al-Husseini, Hajj (Muhammad) Amin." Sela. The Continuum Political Encyclopedia of the Middle East. pp. 360–362. See p. 361. ^ ""As the Arabs see the Jews"". Kinghussein.gov. 1 January 1999. Retrieved 9 June 2017. ^ a b Karsh, Efraim (September 1996). "Historical Fictions". Middle East Quarterly. 3 (3): 55–60. Archived from the original on 7 February 2013. Retrieved 13 December 2012. ^ Graham Jevon (27 April 2017). Glubb Pasha and the Arab Legion: Britain, Jordan and the End of Empire in the Middle East. Cambridge University Press. pp. 64–65. ISBN 978-1-316-83396-4. ^ a b Sela, 2002, 14. ^ Karsh, Arafat's War, 43. ^ Dayan, Moshe (1976) Moshe Dayan. Story of my Life, William Morrow. ISBN 0-688-03076-9. 16 and 30 January 1949 – page 135; 19 and 23 March – page 142; 17 December – page 144. ^ Ghali, Paul (4 August 1951). "Constant Threats on Lives Tie Hands of Arab Leaders". Corpus Christi Times. Retrieved 1 July 2018 – via NewspaperARCHIVE. ^ Lunt, James. "Hussein of Jordan". First published Macmillan London Ltd, 1989. Fontana/Collins paperback edition 1990. pp. 7,8. ^ Rogan, Eugene (10 April 2012). The Arabs: A History. Basic Books. ISBN 9780465032488. ^ Michael T. Thornhill, ‘Abdullah bin Hussein (1882–1951)’, Oxford Dictionary of National Biography, Oxford University Press, 2004, accessed 24 November 2006. ^ Wilson, 1990, p. 211. ^ S. G. T. (1951). "King Abdullah's Assassins". The World Today. 7 (10): 411–419. JSTOR 40392364. ^ Lunt, p. 9. 'Abid Ukah a cattle broker, his brother Zakariyya a butcher, Farhat a café owner. Husseini "pleaded his innocence throughout." ^ The Hashemite Royal Family. The Hashemite Royal Family Archived 12 October 2017 at the Wayback Machine Retrieved 15 September 2017. ^ "Christopher Buyers, "Al-Hashimi Dynasty Genealogy"". Archived from the original on 26 September 2011. Retrieved 11 April 2008. ^ "Boletín Oficial del Estado" (PDF). Archived (PDF) from the original on 29 April 2014. Retrieved 28 April 2014. Alon, Yoav. The Shaykh of Shayks: Mithqal al-Fayiz and Tribal Leadership in Modern Jordan, Stanford Univ. Press, 2016. Bickerton, Ian J., and Carla L. Klausner. A Concise History of the Arab-Israeli Conflict. 4th ed. Upper Saddle River: Prentice Hall, 2002. Hiro, Dilip. "Abdullah ibn Hussein al Hashem." Dictionary of the Middle East. New York: St. Martin's Press, 1996. pp. 3–4. Michael Oren. Six Days of War: June 1967 and the Making of the Modern Middle East. New York: Ballantine, 2003. ISBN 0-345-46192-4 pp. 5, 7. Rogan, Eugene L., ed., and Avi Shlaim, ed. The War for Palestine: Rewriting the History of 1948. Cambridge: Cambridge University Press, 2001. Rogan, Eugene L. "Jordan and 1948: the persistence of an official history." Rogan and Shlaim. The War for Palestine. 104–124. Sela, Avraham. "Abdallah Ibn Hussein." Sela. The Continuum Political Encyclopedia of the Middle East. 13–14. Shlaim, Avi (1990). The Politics of Partition; King Abdullah, the Zionists and Palestine 1921–1951 . Columbia University Press. ISBN 0-231-07365-8. Shlaim, Avi. "Israel and the Arab coalition in 1948." Rogan and Shlaim. The War for Palestine. 79–103. Tripp, Charles. "Iraq and the 1948 War: mirror of Iraq's disorder." Rogan and Shlaim. The War for Palestine. 125–150. Wilson, Mary Christina (1990). King Abdullah, Britain and the Making of Jordan. Cambridge University Press. ISBN 0-521-39987-4. Wikimedia Commons has media related to Abdullah I of Jordan.